BBC News (YouTube) published this video days ago, amidst the flurry of media speculation surrounding the possible kidnapping or murder of Saudi journalist and government critic Jamal Khashoggi, after he walked into the Saudi consulate in Istanbul and was not to be publicly seen again thereafter. 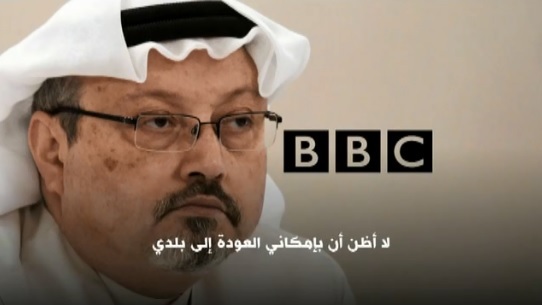 The BBC video essentially entails an audio exchange between a reporter from the BBC World Service radio and Khashoggi, in which the latter describes the complete absence of freedom of expression in Saudi Arabia even for government loyalists exchanging views in private gatherings. It is unclear when the exchange between the reporter and Khashoggi took place exactly. – Saudi journalist Jamal Khashoggi: I found myself doing a lot of travelling, now I’m living between Istanbul and Washington D.C.
– BBC Reporter: when do you think you’ll be able to go home again? – Khashoggi: you see when I hear of an arrest of a friend who did nothing that worth to be arrested, make me feel I shouldn’t go. I’m talking…my friend of mine who was arrested wasn’t even talking. Maybe he was talking critically over something at a dinner party. – Khashoggi: that’s what we are becoming in Saudi Arabia..
– Khashoggi: and we’re not use to that. – Khashoggi: we never experienced..
– Reporter: but are people spying on each other therefore..
– Reporter: ..you’re saying you can go to a dinner party and you can say something and it might be misinterpreted..
– Khashoggi: yes, people now question why so and so got arrested. Recently a Saudi columnist, an economist, who was close to the Royal Court, got arrested, and that scared many people, because here we are talking about somebody who is close to the government. – Reporter: a dissident, yeah..
– Khashoggi: and until now I don’t call myself an opposition, I always say I am just a writer, I want a free environment to write and speak my mind, and that’s what I do in the Washington Post. – Khashoggi: they gave me a platform to write freely..
– Reporter: if there was that sort of freedom of expression? – Khashoggi: very much, because we are going through a serious transformation that going to involve every Saudi, that going to affect every Saudi, as one of England’s kings says: ‘what affect the people must be discussed by the people’, right? – Khashoggi: so this serious transformation that is happening isn’t discussed. The prince surprise us every couple of weeks or couple of months with a huge multi-billion dollars project, that wasn’t discussed in a parliament, wasn’t discussed in newspapers, and the people would just clap and say: ‘great, let’s have more of those!’. And things don’t work that way.